Players and coaches are coming to appreciate that cognitive conditioning is as important as physical conditioning. After all, it’s the brain that controls the movement of the body. The critical movements of play are all decision-based, and typically made in split seconds. If your brain speed is slow, then your play will be slow -- no matter how physically prepared you are. 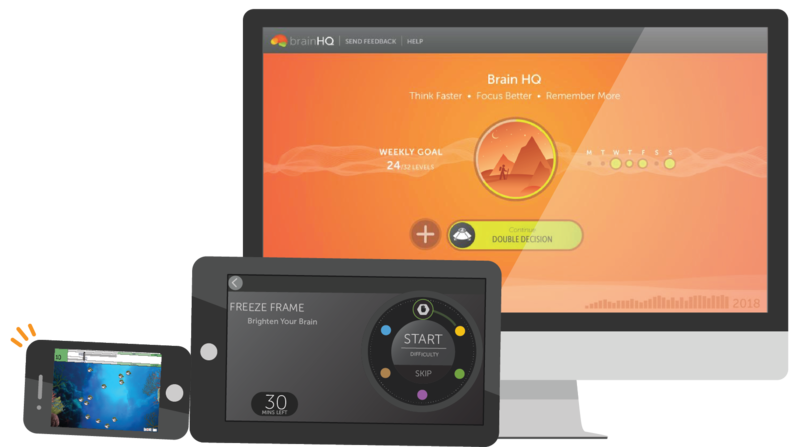 BrainHQ targets brain speed and accuracy, so quicker and better split-second decisions become instinctual. Changing your brain takes some work. While these exercises can be fun, they can also be quite difficult. That's because special algorithms constantly draw on all of your performance in the exercises to quickly personalize each user's experience. Every exercise adapts in difficulty as you work, and gets harder (across multiple dimensions) in order to push you to achieve new levels of peak performance. It takes less than five minutes to do each exercise level, so you can train in small bites or long blocks, depending on your schedule. Plus, BrainHQ lives in the Cloud, so you can access it from pretty much any computer or mobile device. If you want, you can set personal training goals and a schedule, and have the program send you reminders, or, you can just fit it into those unexpected down times, on whichever device is at hand. You train in one exercise for less than five minutes. You're not competing against others. You're competing against yourself, working to achieve and sustain peak performance. BrainHQ has 29 online exercises organized into six cognitive realms: attention, brain speed, memory, people skills, navigation, and intelligence. Registered free users of BrainHQ can sample parts of one exercise every day, through the Daily Spark. Paid subscribers to BrainHQ can access all the exercises, get extensive reports on performance and progress, and can set their training to regimens targeting core brain skills related to sports performance. This includes the Personalized Trainer, which selects exercises for you based on prior performance, goals and time. Training for sports starts with five exercises that target the speed and accuracy of the visual processing system. This is core training. Dozens of other exercises target other cognitive skills that can contribute to peak performance on and off the field. What makes this program unique is the science. BrainHQ is built on the foundation of brain plasticity – the brain’s ability to change chemically, structurally and functionally in response to sensory and other inputs. Hundreds of university-based scientists came together to design, test, refine and validate exercises and assessments in BrainHQ. A wide range of cognitive abilities play a critical role across virtually all sports and positions, especially those listed below. More than 100 peer-reviewed science papers (across varied populations) have shown performance at such cognitive tasks is capable of change, with the right kind of training. Microgate makes the world’s most precise equipment for measuring sports performance — using beams of light to measure movement down to the photon. Microgate sets the gold standard for the analysis and improvement of performance (e.g., acceleration, speed, power, elevation, reactivity, balance), which is why it is used by leading pro and Olympic teams and elite training centers all over the world. In developing a program to improve “true agility" — peak decision-based movement — Microgate was a natural fit. Bigger Faster Stronger (BFS) is the leading athletic conditioning program in the United States — offered by more than 13,000 schools. Its founder Bob Rowbotham was the first strength and conditioning coach in professional sports — proving that the right conditioning could cut player injury by half and improve individual and team performance. What began as a weight room safety program has evolved into a holistic conditioning program to make better athletes and better citizens. BFS immediately recognized that you cannot train the whole athlete until you train cognition. Over the past four years, New England Patriots’ Quarterback Tom Brady led his team to four conference championship games, three conference championships, and two Super Bowl wins. He told us that he had found BrainHQ, in 2014. He was so impressed with the results that he made BrainHQ the fourth pillar (along with physical training, recovery and diet) in the TB12 Method. His TB12 method is now taught to thousands of athletes through the TB12 Sports Therapy Center, and has Tom performing at his best ever, as he turns 41 this year. When it comes to the brain health and performance of America’s special forces and other active duty military personnel, there may be no more impressive facility than the National Intrepid Center of Excellence. As is true at more than 20 other military and veterans facilities, BrainHQ is used to help improve cognitive performance in people who have already achieved top physical conditioning. 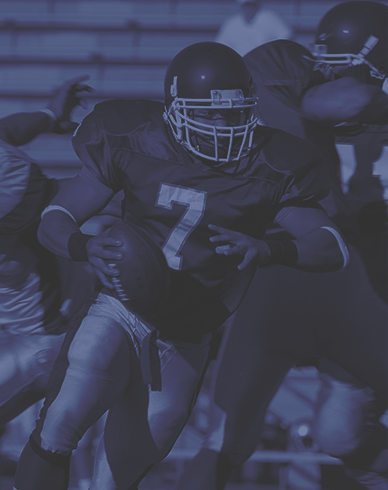 The Canadian Football League Alumni Association (CFLAA) is committed to supporting its members, who played pro football in the Canadian Football League. As a result of the experiences of CFLAA members taking part in The Canadian Sports Concussion Project, CFLAA approached us about working together. CFLAA members face both the typical concerns about degradations in brain performance from aging – which starts in your late 20s or early 30s, whether or not you ever played pro football – as well as the additional concerns of those who may have had concussions or repetitive sub-concussive head impacts. We offer a special programs that supports CFLAA to CFLAA members and fans.